It has been a busy work week this week, but without too many exciting places to go to. Actually I spent most of the week out at Williams Field (the airfield on the permanent ice) working on getting them power, hooking up generators, installing electrical service to buildings and wiring the jamesways for receptacles and lights. Not a terribly exciting week, but I enjoyed being out of town. We have also had some of the worst weather I have seen since I arrived here. We even hit condition one a couple of times. Condition three is the nicest weather and condition one is the worst, with visibility dropping below 20 feet at times. We have had a lot of snow, which is unusual here since this is really a frozen desert. There is very little precipitation of any kind, so a snow storm is rare. And yet it has snowed a little most of the week. 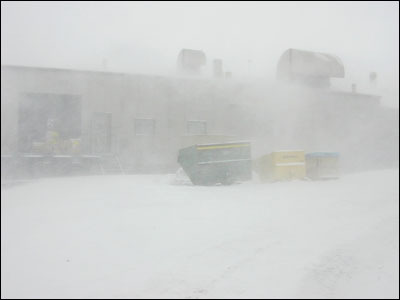 Today was the worst weather I have seen yet and, wouldn't you know it, I was working outside installing a panel for airplanes to plug engine heaters into. All vehicles have electric heaters installed in the engines, so there are many areas with plugs to plug the vehicles into to keep the engines warm. Otherwise you would never get them started. 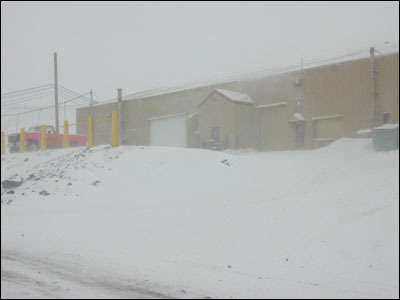 As it was not such an exciting week, I thought you might like to know a little bit about life in McMurdo Station. 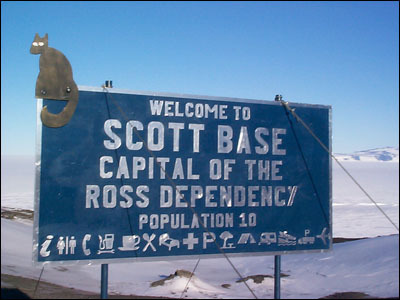 Ross Island (where McMurdo is located) was first discovered by Capt. 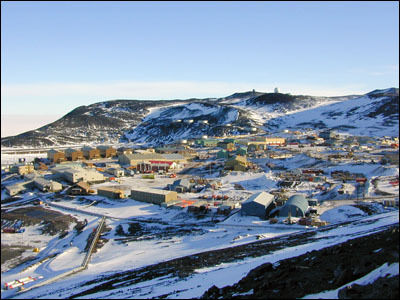 James Clark Ross in 1841, and McMurdo Bay was named for his Lieutenant Archibald McMurdo. 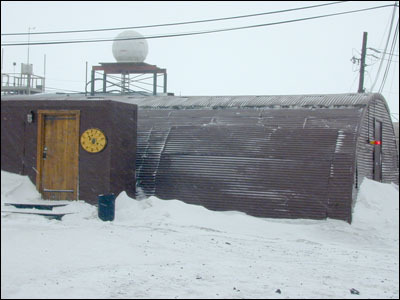 Although some early explorers had built huts in this area around the turn of the century, McMurdo Station was not established until December 1955. 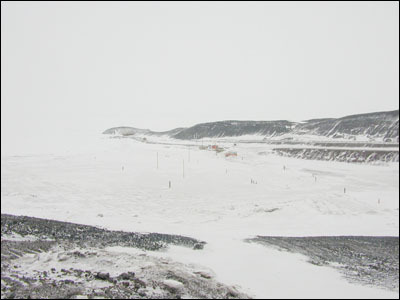 Operation Deep Freeze I established a base here in preparation for the extensive and continent–wide scientific activities of the 1957–1958 International Geophysical Year. 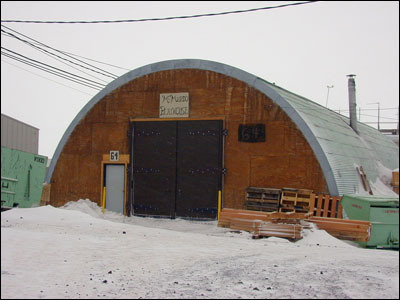 The town looks rather industrial, with Quonset huts and other prefabricated buildings. They may not be pretty, but they are certainly functional for this area of the world, providing warmth and shelter from the elements. The primary buildings here are scientific. After all, that is the reason we are here. The largest is the Crary Science and Engineering Center which has 46,500 square feet of working area. There is also a weather station and weather balloon inflation tower. For the marine biologists there is an aquarium which houses marine organisms from McMurdo Sound. There is a dive locker for the ice divers which houses all of the dive and diving research equipment. The man in charge of the dive team is named Norbert Wu and he has produced and filmed many films and documentaries on sea life in Antarctica. 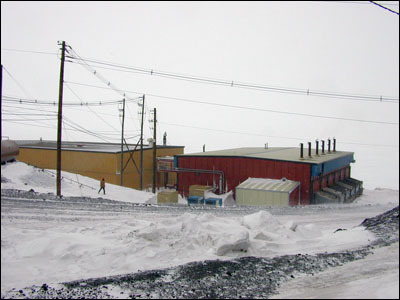 We have our own water plant (the building on the left) which provides all the water we need through reverse osmosis (the largest plant in Antarctica). Sea water is converted at approximately 60,000 gallons per day. Our power plant (the building on the right) is powered by diesel fuel. Fuel costs are high as it all has to be flown in. A couple of months in the summer (January & February) fuel can be brought by ship, but other than that it must be flown. 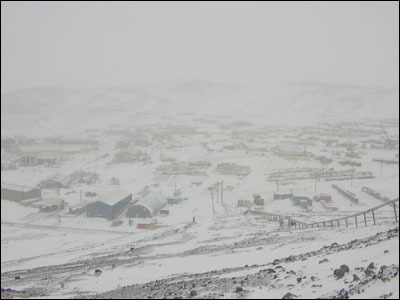 Of course fuel costs for the South Pole, which is much further inland, increase by more than 10 times the cost of McMurdo. the paint barn, a fuel station and many fuel storage tanks. 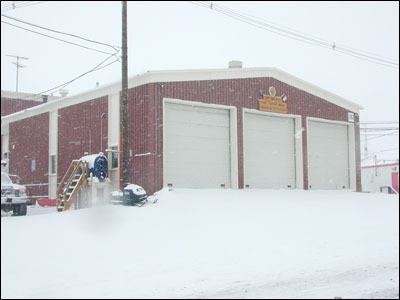 There are several supply warehouses for materials hardware, wood, steel, electrical, etc.). The Post Office also houses Central Supply where you can find paper, pens, and other office supplies. Bear in mind these places are NOT Home Depots or Office Depots. Supplies are limited. But there seems to be enough to make do. There is a pier and port for ships when the harbor is thawed out. We have a medical facility. It has the bare necessities, but if someone gets really sick, they have to be flown to New Zealand. However, there is a recompression chamber facility to treat dive–accident patients and others who may need hyperbaric oxygen therapy. In fact one of the divers has been in the chamber off and on for several days this past week. He is doing better now. They want to medevac him to New Zealand, but he is unable to fly at the moment. We have a fire department, but no police force. Any trouble would be handled by the fire department, but there really isn't any trouble. Fire is our biggest threat because of the dry and windy conditions. Fires start fast and spread fast. Consequently, there is no cigarette smoking in the buildings except in designated smoking lounges (there are only two on base) or outside. No candles or incense are allowed, or hotplates, or anything of that nature. and Southern Exposure Bar (a smoking bar). There is also a Coffee House. The cappuccino isn't too bad, but remember — there is no such thing as fresh milk down here. It is all powdered and really awful. I have not been to either of the bars yet, but the coffee house is very nice. It is a great place to meet and play games. Cribbage is big down here and I have played a few hands of that. There are special events throughout the year. We just had a big Halloween party. Many people dressed up. 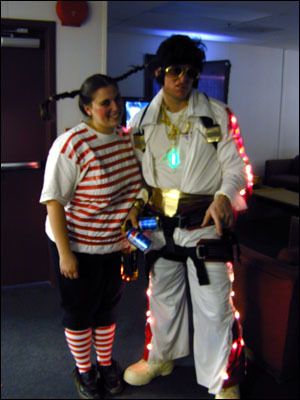 A few people had brought costumes with them, but most made their own out of anything they could find to work with. 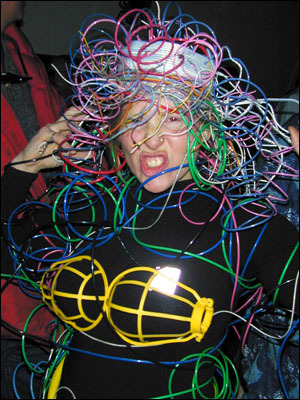 It made for some very creative and interesting costumes. There are foot races, a chili cookoff, talent and other performances, an art show, bingo nights, and holiday celebrations. There are 14 dormitories and most are quite full. All the buildings are numbered in the order they were built, rather than location, so finding your way around town is sometimes difficult. 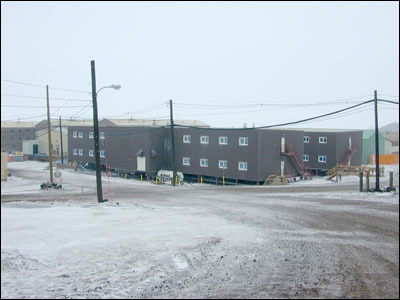 The most central building is 155, and it houses some dormitory rooms, the galley, the store, the barber shop, the computer room (where we access e–mail), the recreation office, the radio station, the television station, the finance office, and the ATM machines (2 of them). The galley is where all of our meals are served, and also serves as the location for science lectures, movies and such. The galley does an excellent job of providing meals. They are all pretty palatable, however food is all frozen and usually well past its 'use by' date. We do have a greenhouse which grows a few of our fresh vegetables, but it couldn't possibly grow enough for everyone. It uses all artificial lighting. Even though we have 24–hour sunlight right now, the angle is too low to provide a lot of heat. Still it is a very nice place to go and visit. To walk amongst green plants in a warm and humid environment is quite a treat on the ice. There are even some hammocks so you can just relax and enjoy it. We also have a chapel. 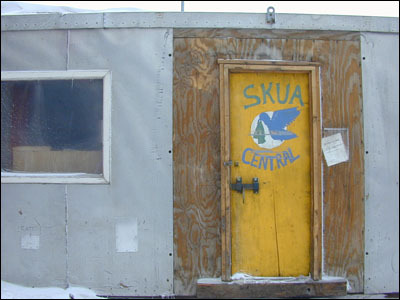 Among the local vernacular is the word "Skua" (pronounced: sku–ah). A skua bird is something like a seagull and once the ice melts they will be most plentiful. They are scavengers and will take just about anything. We have made a verb "skua" meaning to take something someone else has discarded. For instance I 'skua–ed' a small chest of drawers for my room. 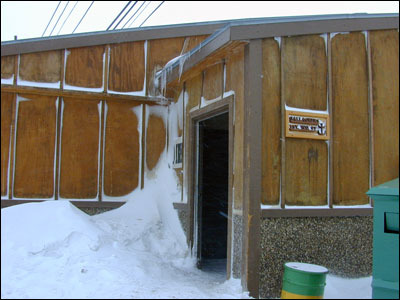 There is a small building here where people who are leaving the ice will put things they don't want to bother taking. Anyone is free to go there and take what they want. The building is called Skua. You find all kinds of things there — clothes, books, soaps, shampoo, occasionally a TV or radio. You never know. So it pays to check it out from time to time. The best time of course is on the changeover from season to season. After winter when people are going home, there are always a lot of great things to find there. 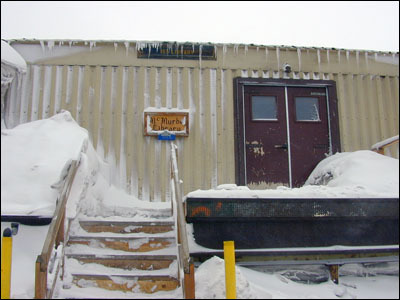 We have a fairly good–sized library with quite a nice selection of books on Antarctica, as well as many other things. The Antarctic books are reference only, but all the others can be checked out for two weeks. 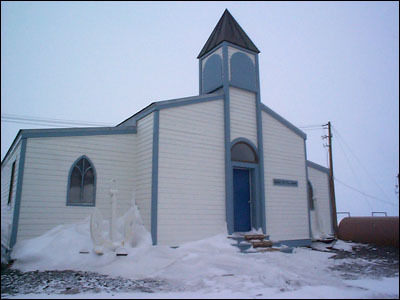 I went to a meeting of the McMurdo Historical Society last week and we are going to try and start a local museum. There are so many artifacts and historical items still around from the early days of exploration up to the present that it would be a shame to lose them. We do not have a building as yet, but are working toward that end. We are not without local sports either. There is a gym with a basketball court, racquetball, and volleyball, and a climbing wall. There is also an exercise room with many exercise machines. Upstairs is a bowling alley. There is softball and soccer, and I am told golf (I assume they use golf balls that are something other than white). 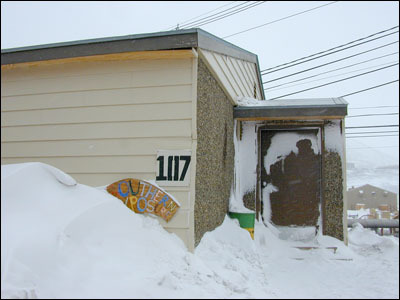 We even have the McMurdo Playhouse (below). So far, I have avoided going there, but word is starting to leak out that I have had a little experience in the theatre, so I may not have a choice. As you can imagine, waste management is a very large facility here. All of our wastes, except human wastes, are separated and sent back to the United States for recycling. Some of the waste is burned for energy, but most (70%) is recycled. I am told that the United States only recycles about 20% of their waste. The reason our percentage is so high is that we are all required to sort our trash into 24 separate waste categories, 11 of which are recyclable. The purpose of all of this is to keep the human impact on the continent to a minimum. One of the goals of the Antarctic Treaty is to keep this continent in pristine condition. That is why it is such a wonderful place for research. 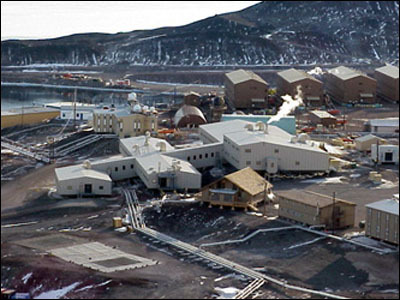 McMurdo is located just two miles from Scott Base, which is the New Zealand base. As I hope you can see from the sign (below), the fellows at Scott Base have quite a sense of humor, but all the claims on the sign are true. 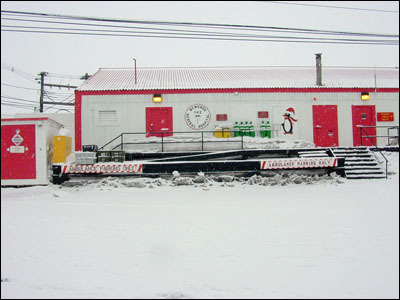 It is a very small base with less than 100 people in the summer and only around 10 in the winter, but they also have a bar and a store. Their store has a few more interesting items than our store so we try to walk or take the shuttle there when we can. 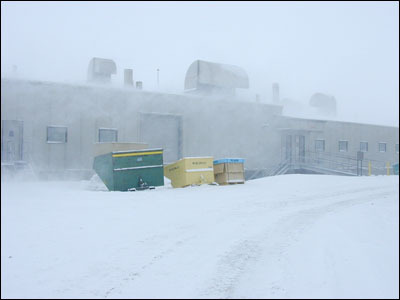 The buildings at Scott Base are made from polyurethane foam, sandwiched between steel sheeting and are heated by reticulated hot water. They are linked by all–weather corridors and can be isolated by fire doors. All the buildings there are painted green. There are many vehicles of all kinds on base. Snow plows, snow blowers, bulldozers, cranes, all kinds of heavy equipment, sprytes and other tracked vehicles, nodwells, deltas and other large–wheeled vehicles, pick up trucks, and vans. 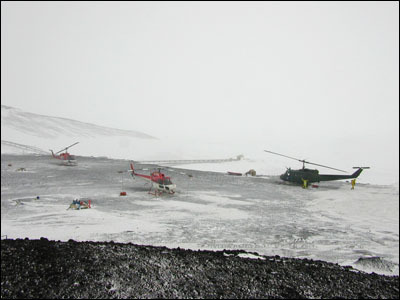 There is a local shuttle service going to the ice runway and another going to Scott Base. Those run every 1/2 hour. 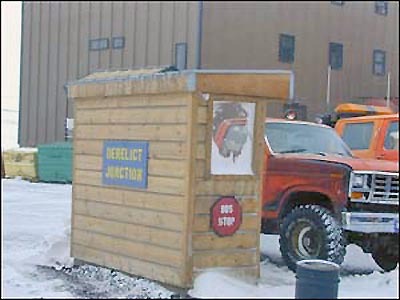 We even have a bus stop, known as Derelict Junction. All in all, McMurdo is a pretty nice place to be. Just think: no mosquitos, no roaches, no flies, no white flies, no yellow jackets, no wasps, no spiders, no termites, no mice, no rats, no skunks, no snakes, no chiggers, no ants, no poison ivy, no poison oak, no pollen, no hay fever, no pollution . . . air, noise or water, no heat strokes, no air conditioning, no traffic jams, no grass to mow nor weeds to pull, no trees to trim, lots of opportunities for learning, no leaves to rake, no dogs to mess up your yard, no floods, tornados or hurricanes, no utility bills, no cooking . . . for most of the population, no dishwashing . . . for most of the population, no insurance agents or telephone solicitors, free maintenance on all housing, free meals, free ice cream . . . anytime, free computer lessons, free computer usage, free hair cutting/styling, free housing, free photocopies, free taxi service, free shuttle service, free air transportation to and from Antarctica, free vehicle maintenance, free gas and oil, free outdoor clothing and gear, free medical treatment, free saunas, free movies, year–round cross country skiing, a high percentage of diversified and interesting people, and some of the most beautiful scenery in the world!